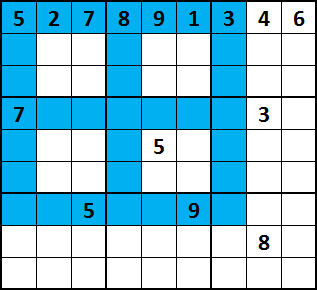 Every blue square means, it is the left-top of a 3x3 block with each numbers [1 to 9] appearing only once there. There is only one unique solution. 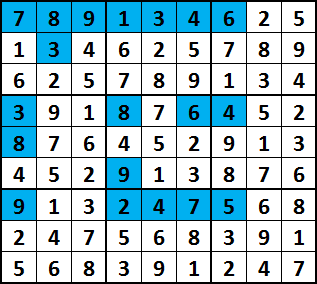 The positioning of the blue squares gives a very particular pattern in the numbers. Looking at the first 3 columns, the 1st, 4th and 7th row have the numbers 2,5,7 in different orders. 2nd, 5th and 8th have 3,4 and 6; and the 3rd, 6th and 9th row have 8,9,1. The same pattern applies per 3 rows. With the given numbers, this allows solving quite easily. Also, though I only see it now, groups of 3 numbers appear in the same horizontal order in every 3x3 block, and go down diagonally within every group of 3 rows. See e.g. 527: top row in the upper left block, middle row in the upper middle block, lower row in the upper right block. The same doesn't seem to hold true for vertical ordering. when you have two adjacent blue squares, it tells you that two "parallel" blocks of three squares contain the same set of three numbers, which is extremely constraining. Not the answer you're looking for? Browse other questions tagged logical-deduction grid-deduction sudoku or ask your own question.